Upcoming career events are listed below for employers. Please note that students from other institutions are not necessarily invited to attend the events listed below. To find out if students may attend a career event at another institution, please contact the host institution's Career Services Office directly or check their website for more information. 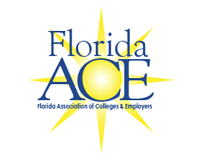 Current FloridaACE member institutions may submit career fairs to be added to the list below. If you would like your event included, please email the name of your institution, title of the event, dates and times, location, and a link to more information to the FloridaACE Information Management Director.